Well...as expected all my favorite people are headed off to read my defense of Al Gore. Hope you all liked it. It was so hot today I got my rollers out and rode indoors (maybe). If you're nice I'll tell you about my perfect Saturday morning sometime. The City of Sioux Falls has the Sioux Falls Bike to Work Day PSA is in the can and bootlegged on the Club FAB website. Yeah that's right, FAB scooped the official Bike to Work site. In the video you might see The Dad, The Owner, Snakebite and one of The Iconoclasts. Oh yeah, and reportedly the bike cops just happened by during filming and were persuaded to participate. I think their enthusiasm is evident. UPDATE: the defense can be found here. Sorry. No post today. I just left a 500 word comment on someone elses blog. It's a defense of Al Gore. It's ok though, in conclusion I say that I think he's wrong. I only did it because I like the blog and the blogger. Maybe the blogger will give me permission to link to it. It's been a long time since I've given a report. I see these as important because I want to avoid misrepresenting how much I use (or don't use) my car. January 8-14 was the last time I reported. January I was very busy with other blogging topics and the weather kept my numbers sufficiently bad. I took February off from blogging. March, April - did these months happen already? See. I better bring back the reporting. The next report is already going to be worse. The local daily ran a little feature about local bike clubs today. There's a rumor going around that Mr. Bite is quoted. I've read the article a couple times and I don't see mention of Snakebite anywhere. 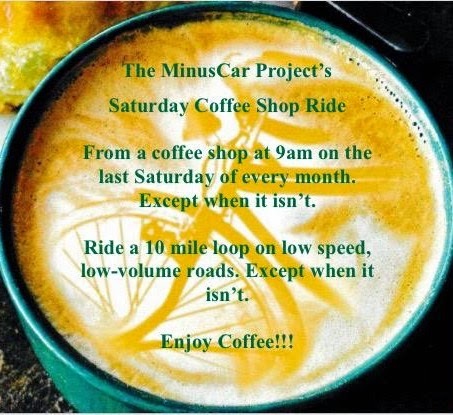 FAB even has a Coffee & Doughnut Ride. I noticed Google is displaying an iceberg (maybe it's a glacier?) which reminds me that it must be Earth Day. Some of my conservative friends will think that I’ve been gearing up for this day for a long time. I prefer to think of it as a Sabbath day; a day of consuming and producing as little as I possibly can. As I was opening this week’s set of bills and solicitations I noticed the League of American Bicyclists (LAB) is attempting to cash in on Earth Day and Climate Change. Seems they think bicycling is a helpful way to mitigate global warming. I agree. Tom DeWeese was right, there’s a lot of money to be gotten off this climate thing! Maybe I’ll send them both a little something…’cause there’s a lot of money to be gotten off this climate thing. Over the past few days I’ve been running into sustainability and green ideas in unusual or new (and welcome) places. LAB’s solicitation is, to my knowledge, the first time they’ve talked global warming. At investment club the two annual reports I reviewed contained surprises. “…the most environmentally sound, inexpensive and reliable kilowatt hour is the one we don’t have to produce. Generating “save a watts” is just one part of the equation that requires our customers to change how they use electricity…"
Is that a call to personal responsibility? The second report was from Corporate Office Properties Trust. They were touting their LEEDS Certified buildings and made the statement that green, sustainable buildings are the future. I learned a little about LEEDS Certification this week. I was inviting the Museum of Visual Materials to join the Bike to Work Celebration. When they open in June they will have a shower available for people who commute to downtown by bicycle. I understood the building was going to be LEEDS certified so I asked my contact there about it. I wonder how my wheat allergic The Boy 5 will like the cabinetry. Perennials are done. Next up, the backyard garden. Update 4/19 8am - I watched a bunch of Virginia Tech YouTube video this morning. This post, when placed next to those videos, becomes much less funny. Sorry about that. But the horse - still. golden. Someone sent me an online quiz today. By looking at a photo can you tell the difference between a programming language inventor and a serial killer? I'm a little afraid of what this says about me; I got 10 right out of 10. And then from Fat Boy Cyclist's post this video of a horse that jumps a fence and joins a peloton. Wow. Have I mentioned there’s a new bike club in town? It’s true. More on that to come. This morning I rode to the neighborhood Caribou coffee for a celebratory cup of joe (decaf please). Twenty urban, bike trail free miles later and the party was over (I live in a big neighborhood). I’m celebrating because Snakebite (Mr. Bite to you) is over there talking about how busy he is and yesterday was my lucky day. It’s because Snakebite is so busy that I get to have lucky days. As I mounted my bike at the end of a long rather pleasant week of work the Snake-phone rang. “Hey, I just want you to know that Rich Show will play for Bike to Work.” And with that statement the picture of how I would paint a Sioux Falls Bike to Work Day celebration was complete. I can't write about Bike to Work Day and sound like I'm the only one who's doing it. There's a committee of 5 to 10 people who are actively trying to make the whole day work. The Owner is one. Snakebite is one. Maybe I’ll introduce the others after the day proves successful. In a few weeks I’ll get to face my biggest fear – what if you throw a party and nobody comes? An advantage of doing what I can about global warming is I get to trade my biggest fears for things I actually can do something about. Three of the best words in the English language, "Yeah, me too." Today I came across an article that appears to have run in the Yankton, SD newspaper. It's an interview with NorthWestern Energy's Corporate Communications Coordinator Tom Glanzer about compact fluorescent light bulbs. "Instead of spending more money on making more energy, we need to also focus on ways we can save energy." "The bottom line is, we have to think of our environment. If we were all using compact fluorescents, there'd be a lot less energy usage across the U.S. We need to be aware of how much impact we can have by making such a small change." This is the sort of energy company I could like! A .pdf of the article can be downloaded here. Any connections between this article and MinusCar Essay #2.3 are your own to draw. This is the final part of a series of three. Part I and Part II are…well follow the links. Is Mr DeWeese correct? Do climate change scientists stand to be granted massive grants from government, private foundations and EVEN corporations? Should I be concerned about who is funding these scientists? Should I follow the advice of Mr DeWeese and follow the money? Following the money is difficult because corporations don’t hire scientists. Scientists must appear to be “independent” and “neutral.” If only there was a tool. Someplace that did a whole bunch of research…maybe there’s something on the internets...someplace that would tag organizations with big red dollar signs if they’d received funding from certain corporations. Corporations like ExxonMobile for example. This appears to be a true statement. Fred “Ferris Wheel” Singer seems more appropriate. Clearly funding sources are very difficult to define and find, otherwise Tom certainly would have mentioned this. How about the American Policy Center’s board of directors? Well two funded out of three ain’t bad…as they say. He’s a little behind the others. Hope he doesn’t have Exxon Envy. Thanks for the advice Tom...and the article clearing up the issue of climate change for the “little girl” in elementary school. Hi. I used to blog The MinusCar Project. Illness, work, play, all get in the way. I can still rhyme when I take the time though. Let’s go. A couple posts ago I was preparing to deconstruct the article, “Forcing Global Warming Nightmares On Children” in the American Policy Center’s, The DeWeese Report. Mr DeWeese offers many examples of skeptical climate change science. He begins with a popular quote from a Duke University study, “The magnitude of future global warming will likely fall well short of current highest predictions." This is quite the hopeful study. I read a few articles and didn’t find much negative about it. The Duke University News report article is here. A Washington Times article is here, it bothers to mention contrary reports from the University of Toronto, University of Chicago, Oregon State, the Carnegie Institution and Harvard. A pessimist view of the quote might look like this. On a scale of 0 to 100% of life lost on the planet what’s significantly short of 100%. 50%? The bulk of the letter to the student is a lot of unsourced scientific data demonstrating that global warming is indeed a dubious theory. Mr DeWeese saves special derision for the United Nations’ Intergovernmental Panel on Climate Change (IPCC). I suppose it would surprise Mr DeWeese to learn that the week the Supreme Court ruled that CO2 is a pollutant. I guess it’s all in how you or those activist judges define it. Perhaps Mr DeWeese doesn’t understand the concept of too much of a good thing. Mr DeWeese busts the IPCC hard for their 1996 report that dropped these two “damning” statements prior to publication. "None of the studies cited about has shown clear evidence that we can contribute the observed climate changes to increases in greenhouse gases." "No study to date had positively attributed all or part of the climate changes…to man-made causes." Is there any chance the IPCC dropped these statements because they couldn’t be substantially supported? Even so, is it possible that 11 years of continued research might also deem the statements unsupportable? After the science Mr DeWeese switches gears and talks about money. Next up: Following the advice of Mr Tom DeWeese.